Dallas to Sydney is the second longest flight in the world with a total of 17 hours straight in the air, so I know a thing or two about surviving long flights. After doing this leg a couple times now, I’ve come up with a pretty comprehensive list of everything you need to survive a long flight. That being said, these are also great to bring for shorter flights as well! First things first, the type of carry-on you bring is crucial. I used to use The North Face Borealis backpack and it’s great, but I just upgraded to one that’s better suited for my gear needs (read: all my camera stuff). I am now using the Pacsafe Camsafe V17 Anti-Theft Camera backpack. It’s security features make it perfect for travelers! The fabric and straps are made of eXomesh and are slash-proof. There are RFID blocking pockets that protect from scan scam. The zippers have a clip lock, making it difficult for pickpockets. It also has a front chest clip for comfort and security. PS – they don’t just make camera bags, they make all kinds of anti-theft bags including luggage, purses, wallets, and more! This is a must. There is nothing worse than being chained outlet charging your phone. It’s also nice to have on the plane so your phone is fully charged when you reach your destination! There are quite a few cheap ones on Amazon, but this one is my fave. It is smaller than your phone and super light, has really fast charging speed, and holds enough battery to recharge an iPhone 2.5 times. Obviously, you need these in your carry-on, but I decided to invest in a passport wallet combo. That way, I can keep my passport, drivers license, credit card, and plane tickets all in one convenient holder. I opted for a RFID blocking one as well, just to be safe! Unfortunately, I am not one of those people gifted with the ability to sleep anywhere so an eye mask at least helps “trick” my body it’s night time. I went with a simple black silk one on Amazon that was highly rated. But I love how fun some of these are! Another must for getting the best sleep possible. I personally like to sleep on my side which is obviously not going to happen on a plane, but I will most likely lean my head to one side or another. With that in mind, I went for the one that had extra support on the sides. It’s a bit pricey, but Amazon has quite a few highly reviewed pillows for cheaper, like this one. There are few things worse than having to listen to a crying baby or screaming child on a long flight. Noise-canceling headphones should help. My mom got me these Rose Gold Beats by Dre as a going away gift (she’s the best), and I LOVE them! Airplanes are one of the best places to get in some serious reading time. I love reading on my kindle, but I understand those book lovers who only like reading an actual, physical book, so sub for books here if that applies to you 🙂 Who doesn’t enjoy the occasional trashy magazine? This includes both normal glasses and sunglasses. With the air being so dry, you are NOT going to want to wear your contacts, they’ll feel like sandpaper. I usually end up not really using my laptop on flights unless I have work to do. Most airlines have a great selection of movies and TV shows included, plus it’s often easier to watch on the screens on the back of the seats. I still suggest bringing your laptop on board — I wouldn’t risk checking it. I have a Macbook Air and its great for traveling because it is so light. There is no way in hell I’d ever check my camera bag. One, it would add a lot of weight to the bag, and I need to save where I can. And two, I would be devastated if anything happened to it. But instead of lugging around a huge camera bag, I was able to find a smaller soft cover to protect it while it’s in my backpack. With long flights, you’re definitely going to want to change into some more comfortable clothes. I’m bringing my favorite lounge pants (literally the softest material ever) and a cozy t-shirt. I’m also packing some slipper socks for the plane: they’ll keep your feet extra warm and you don’t have to worry about putting your shoes back on if you need to walk around the cabin. And don’t forget an extra change of underwear/socks/etc, you’re going to want to feel fresh after sitting 17 hours if ya know what I mean. The amount airports charge for bottles of water is stupid. Save your $8 for a cheesy souvenir and bring your own reusable bottle to fill up. My fave is the CamelBak, it doesn’t leak, comes in a bunch of fun colors, and won’t sweat all over your stuff. Also, comes in a glass version if that’s more your thing. Just the basics: mascara, eyeliner, tinted moisturizer, bronzer, concealer (your tired eyes will thank you). This Kate Spade makeup bag (similar one here) is the perfect size for traveling! I prefer rose salve, you can get a version of it practically anywhere. It can also be used for elbows, knees, cuticles, etc. Whoever invented the rollerball perfume, I love you. It’s perfect for traveling and keeping in your purse. My current favorite is Flowerbomb. These are great for taking off make-up and using all over to feel refreshed midflight. I like these Yes to Coconut ones, they smell amazing and really are moisturizing! If you want your skin to survive a long international flight, a hydrating is a must. 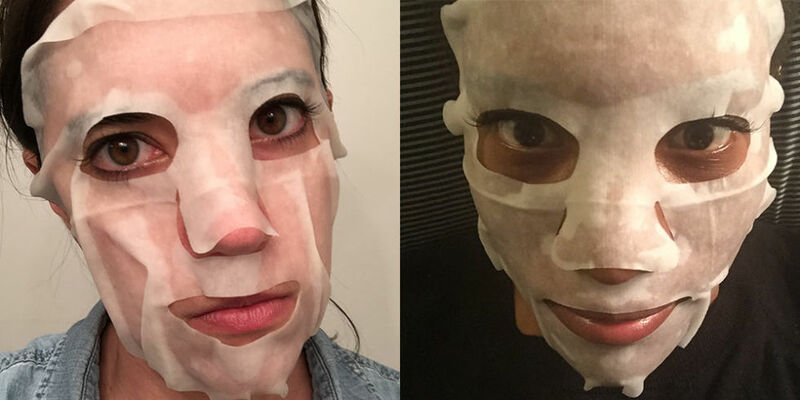 I’ve read on other blogs people doing full face masks and swear by it, but I cannot bring myself to that level of humiliation. Instead, I found these perfect travel-size face masks from Sephora. They have quite a few different options, but I would opt for one that is extra hydrating, like the Lotus or Rose sleeping mask. Tip: If you don’t want to spend a lot on a face mask, go to Sephora and ask for a sample of one to “try out.” It’ll be enough for one use and it’s already in a small travel approved container! This one may be slightly embarrassing, but it works wonders on tired, puffy eyes. Plus, I figure if I do it while I’m sleeping, my eye mask will cover it anyways! Sensing a theme here? This is a great midflight pick-me-up for your skin! I like this one on Sephora, but you find some cheaper on Amazon. Applying lotion regularly throughout the flight will help combat skin dehydration. Some people swear by face oil, but for those with oily skin, I would say stick to regular lotion. Living Proof Dry Shampoo is a lifesaver for traveling hair, it ACTUALLY cleans your hair, I can go days without washing mine now. Colgate Wisps are a great alternative to a real toothbrush when traveling, and they’re really cheap! This is necessary for obvious reasons, you don’t want to be THAT person on the plane. Get my favorite smelling one here. Having something help you fall asleep is going to be a godsend. I personally like Benadryl, ZZquil, or melatonin, but use whatever works for you! I plan on bringing a couple other first aid/meds on just in case, most of these come in travel sizes too: Advil, Emergen-C/Airborne, Dramamine, Tums/Immodium (better safe than sorry), eye drops, bandaids, tissues, etc. I would love to hear any suggestions on what you think is the best to bring on a long flight! **Note: One Chel of an Adventure is a participant in the Amazon Services LLC Associates Program, an affiliate advertising program designed to provide a means for sites to earn advertising fees by advertising and linking to Amazon.com.